Unless your Tress are flexible to avoid snapping off. Have a go of your concept. You ideas have been really great and fun to watch. it is about time, I reached the switch back turnouts and ran a train from the coal dump area up the hill to the switch back turnouts. I cut the front fascia on the hill track for now, it was almost impossible to spike the rail with it in place and I could not take it down because I glued it in place. I had planned to make it removable anyways so if I go and put it back I will have to make some brackets to allow it to be removable. Nice looking train. Have fun running in the new section. It looks like your rail is completely weathered before you handlay it. Are you painting/weathering it beforehand? The frogs, points, and guardrails all look "already done." As for spiking rail in tight spots, I ran into the same problem when I handlayed through a hole in the wall ... with bad access. I ended up laying on the benchwork, drilling spike holes, setting the spikes in place with pliers, then pushing them in with a nail set. I used big spikes in the poor access areas. I do weather the rail before I spike it down. for the turnouts I have been building the center (frog and points) from unweathered rail, when I place it in a tray I made from styrene and add Blacken-it, then I weather all the rail with acrylic paint, for the really rusty stuff I use Polly scale rust with Bragdon weathering powder. For the medium rusty I use Tamiya flat brown and some weathering powder. For this stretch of tray I sprayed the rails Polly scale rail brown with a tad of Vallejo rust colors blotted on here and there. I am using micro spikes and have to predrill every hole, it can be a pain but I like the scale size of the spikes. once I have a section running I go back and spike four spikes for every tie. Have you been able to run your Nova this summer? no, my Nova really fits the Spanish translation...No Go. My son got an old truck that I had to fix, then my daughter rolled her car over so I had to fix that, then my son sold his old truck and got another truck that had a bad motor and I had to put a new motor in it, then I got involved with putting in a motor in my neighbors 1969 Mach I. My car will have to wait another year. Let's hope you escape your servitude sometimes soon so we can see more modeling from you. I actually have been hard at work building turnouts. I just finished all of them at the bench. I found that if I have a repetitive task to do it is faster and easier to get set up and do it all at one time. For the turnouts I build all the "centers" at the bench. I call the centers the part of the turnout that includes the points and frog, the closure rails I layout in place to reduce rail joints. I also purchased a few more Hare turnout decoders to be able to operate the switch back and the runaround at the mine, the other sidings will have to wait a while. 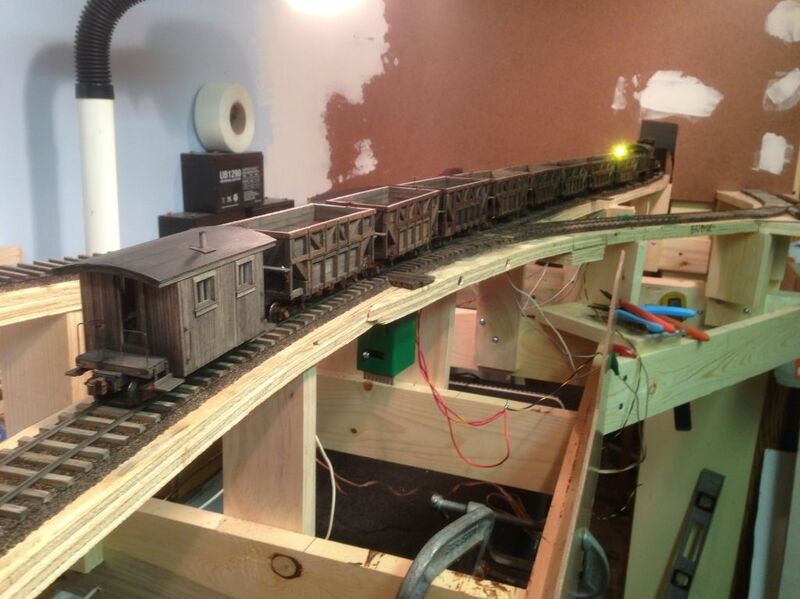 If I keep working at this pace I should have all the tracks in and running by the end of the next month and I can get to doing some 1:48 scale scenery, which will be a first for me, can't wait. BTW, this is nothing really new. I got asked to use a video of my unloading tipple that I had already posted for a demonstration. I told them they could use it but I had made some progress and the video they wanted to use did not show just the unloading of the hoppers, so I told them I would make a shorter one that shows how it operates now. once I get all the track operating and the coal loading tipple constructed I will go back to the unloading tipple and finish up the scenery. I have been really pushing track laying, still trying to reach the big mine. 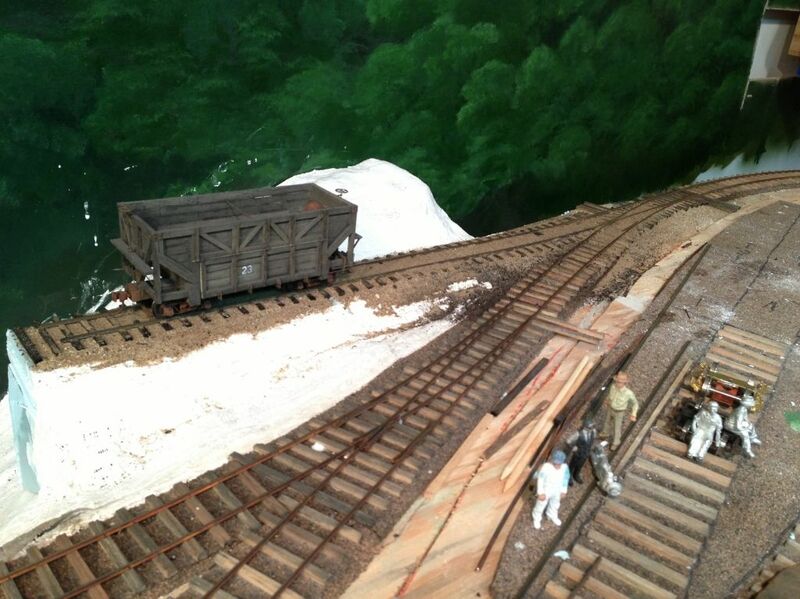 I am almost there, I just spiked down the stock rails for the turnout leading to the mine, it won't be long now. The funny thing is to save time I have been skipping laying the sidings on the way to the mine but I still have to build the turnouts, which is the time consuming part, and on the way to mine it meant that I actually had to build all the turnouts because they all branch off this route. The reality is that once I reach the mine I will only have a few short evenings of rail spiking and track laying will be finished. Hand spiking track is one of my favorite parts of this hobby so finishing it is a little bitter sweet, nice to be able to operate and do scenery but sad to know that I won't be creating new tracks to run on. For some reason I decided to take a break from laying track to the mine and I built the turnout that will be retrofitted into the mainline behind the engine house. This turnout will lead to the coke coal dump bin trestle. I built the turnout at the bench on PC board ties and real wood ties (which I glued to the rails) I painted and weathered the PC board ties to match the wood ties. I used some blue foam to build the new sub roadbed over the plaster scenery and blended it all in with some new hard shell. 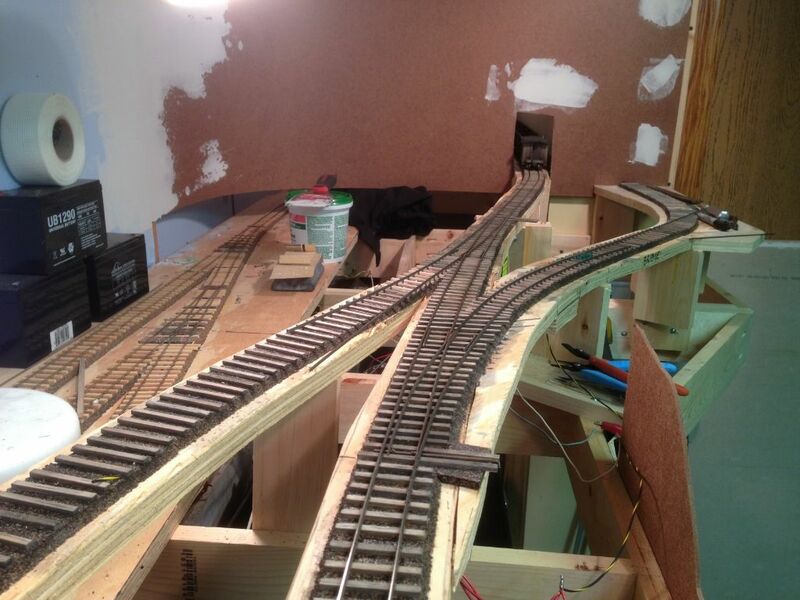 After I got the new turnout cut in I had to use a short section of On3 PSC flex track to span the gaps in the transitions from cork to foam, then from there I used wood ties to the end of the roadbed. 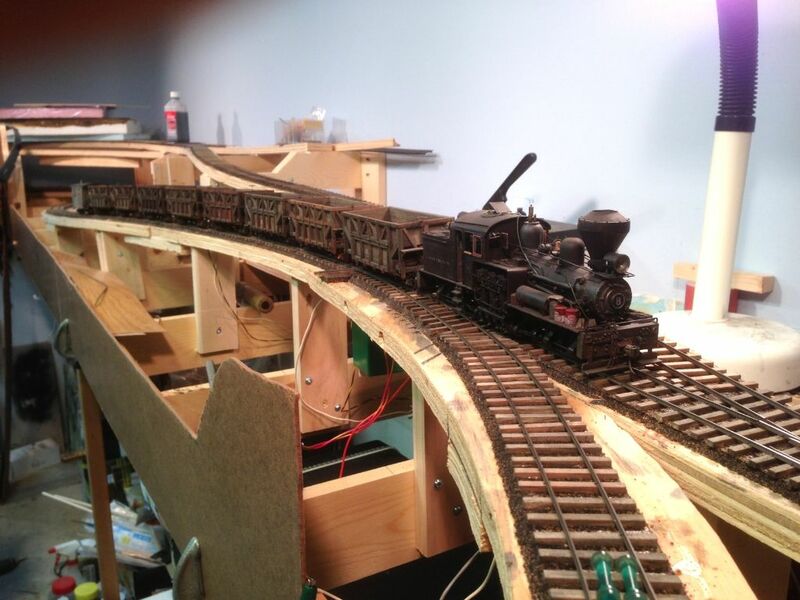 All the track and ties were glued to the foam, painted to match and then I used decomposed granite and matte medium to bind it all to the roadbed. I had to put the sand down to fill in all the gaps and adhere it all together for strength. 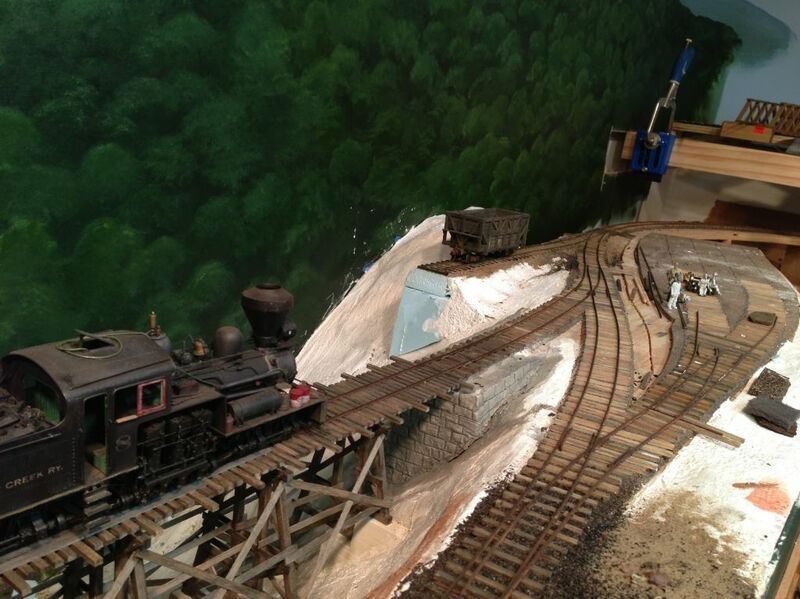 To finish it off I will have to build the trestle and bin. I enjoy your updates as always and look forward to the next one. So you decided to add another spur launching out over the chasm. I assume the coke spur will stub at an unloader. That new turnout will be very much hidden when the enginehouse is installed. How are you planning to throw/maintain/display which way it is thrown? How do you build custom turnounts at the bench? Did you use a tracing of the railheads? Are you using standard frog angles or making them to fit? I wouldn't worry a lot about track laying being 'finished'; as you install scenery & structures, as the seasons change and particularly as you start to operate it, there will be 'adjustment' sessions. this turnout is located almost right next to the engine house, it is pretty easy to see if you stand right in front of the existing unloading shed. I am using the "Hare" turnout decoders and you can see on the DT400 throttles which way the turnouts are aligned as well. I am using the auto throw feature on the Hare to make sure the turnout will be aligned even if it is thrown the wrong way, it works awesome. This unloading trestle will be a stub trestle that will unload one hopper over a bin and allow one empty to be shoved past, so only two hoppers will be unloaded in one shove, no locomotives will be allowed on this trestle so it will require the use of some empty cars to be used as a handle. The coke cars will not be as frequent as the coal to the sizing plant, this is just something to throw in some variety and a little bit of a switching challenge every now and then. The sizing plant also conveys coal to the coke coal storage bin and supplies most the required coal, the bin is just a hold over from the past and is only used during peak demand. As far as building the turnout at the bench, which is how I build all of them this time, I used the free program called Templot. I designed the entire layout using it, actually Racedirector designed the original plan using my AutoCAD drawing as an underlayment, but I redesigned some areas after I forced myself to learn the program. I plotted out my plan from Templot full size which I used to cut out my roadbed and draw my track centerlines. If you go back to the start of this post you can see how I did it. Since I had the track laid exactly where it was on the Templot plan it was easy to just go on the computer and design where the new turnout would be, then print the turnout pattern out. I lay the paper on a piece of Homasote and build the turnout over the paper patter, which fit perfectly.